Patrick Vega of maxon motor uk describes some of the healthcare applications for miniature DC motors. 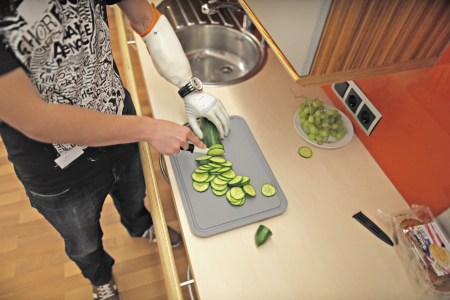 Prosthetic limbs contain DC motors that play a major part in their capabilities. The artificial limbs allow people to gain a sense of feeling of movement again. Imagine something as simple as picking up a glass of water. We require our fingers to wrap around the glass and apply just the right amount of force around the glass to keep it held in your hand. Small DC motors are necessary for these applications. When selecting a DC motor for a prosthetic device, it will need to fill the following requirements: compactness, high power density, high acceleration, lightweight and some require high controllability. maxon products succeed in every single aspect. Next it is a matter of selecting the most suitable drive system to provide the required torque and speed. In maxon’s brushed motor range starting from the smallest, there is the DCX 6 which has a diameter of just 6mm. As impressive as that may be, maxon also creates such small drives below 70V. The brushless range starts as small as 4mm diameter with a length of below 21mm with a mass of just 1.2g. EC Flat motors are popular for many reasons; brushless technology, lightweight, high torque, compactness and low cost. These motors are used in many applications throughout all areas. This year, the company has developed the EC Flat frameless. Forget the motor’s housing, bearings and motor shaft. All you have is the rotor and stator so that you can fully integrate the motor into your design; saving even more space with reduced weight. The brushless frameless motor has a maximum continuous torque of 1.03Nm, add a gearhead and be prepared to increase your torque and reduce your speed to what you want. Combining the size and the pure power of the motor gives an amazing volume-to-power ratio. Running continuously you can be limited, however, if your duty cycle is intermittent then the motors can be overloaded for a period. Great if you want to keep the motor size small and can’t go bigger but require 3 times the nominal torque of the motor for only a few seconds. Let’s take the DCX14L with graphite brushes. If this motor was overloaded to 3 times the nominal torque it will be able to operate for roughly 10.3 seconds, which is the thermal time-constant of the winding. Now if you overload the motor by only 2 times, it will able to run for 51.5 second, which is 5 times longer. Remember that the motor has been overloaded so the winding is very hot at 125C. The motor requires time to cool down. Be aware if time ON is exceeded and not enough OFF time is given, this may cause failure. maxon’s ECX SPEED is very popular in the medical industry for applications that require high speed and high acceleration. Applications include dental drills and centrifuges. This family of products was developed to help the medical industry fulfil its technical and product quality requirements. Unmatched for speed, the ECX SPEED motor tops out at 120,000 rpm. To reach such speeds you will need the available voltage as speed is proportional to the voltage. Take the ECX Speed 13L for instance, it has a stunning 1.58ms, mechanical time constant. Which means that this is the time taken for the rotor to accelerate from stand-still to 63% of the no-load speed of 66,200 rpm. Next issue is how to control such speeds. maxon can control three main parameters; speed, current and position. The company has 1-Q controllers know as DEC controllers, that allow you to set a speed and it will run at that set speed. However, there is no active braking, meaning there is no deceleration apart from the moment of inertia of the rotor and the load. On the other hand, there is the 4-Q controllers which have active braking, so regardless of direction it can be decelerated at a controlled rate. These controller products are the maxon ESCON, EPOS2 and EPOS4. ESCON controls speed and current and the EPOS controls all three. maxon medical based in Switzerland has been designing a new complete unit that has the motor, encoder and controller completely enclosed. This unit uses the new EC Flat Frameless and has been designed to be applicable for exoskeletons.